Personalized license plate frame with 2 lines of text. 20 character limit per line, including spaces and punctuation. Let your imagination roam. Support the troops, your school, your church, your team, etc. You don't have to pick from canned sayings - say it the way you want it said! Personalized license plate frames fit 6 by 12 inch License Plates. Black, Personalized License Plate Frame, fit 6 by 12 inch License Plates. White personalization areas with black letters. Chrome, Personalized License Plate Frame, fit 6 by 12 inch License Plates. Black personalization areas with white letters. 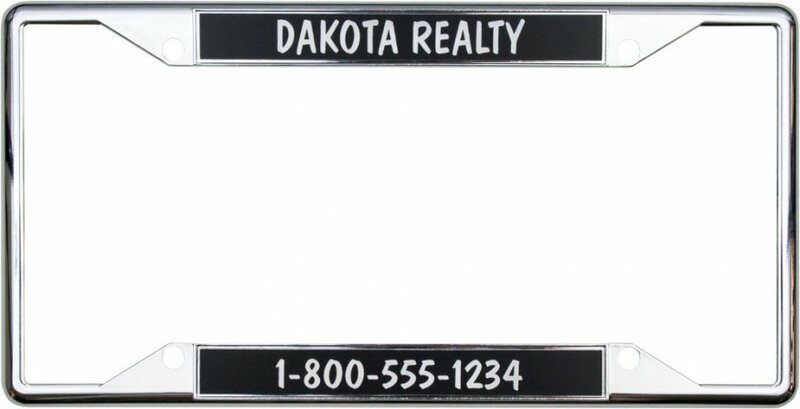 Dual Black Personalized License Frame, fit 6 by 12 inch License Plates. White personalization areas with black letters. Dual Chrome Personalized License Frame, fit 6 by 12 inch License Plates. Black personalization areas with white letters.